KraneShares, a New York-based exchange traded funds (ETF) provider that specialises in Chinese-focused products, has launched the KraneShares MSCI One Belt One Road ETF (Ticker: OBOR) which aims to invest in companies from countries exposed to China’s “One Belt One Road” (OBOR) Initiative. 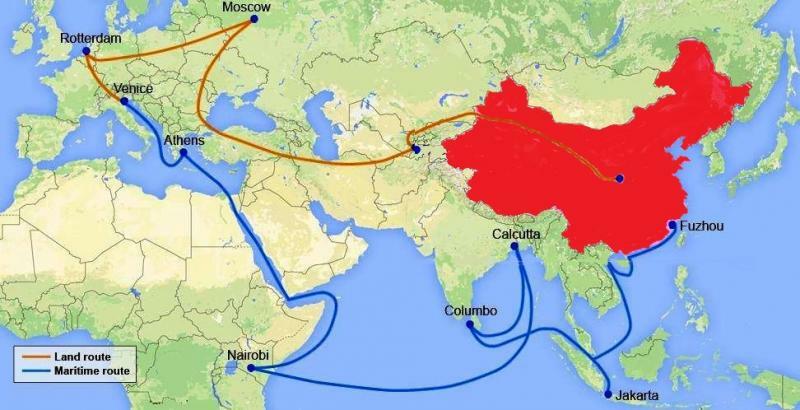 China’s OBOR Initiative was launched by President Xi Jinping with the intention of establishing trade routes between China and countries situated in Europe, Central Asia and Africa. The “belt” refers to the land-based Silk Road Economic Belt (connecting China with Central Asia and Europe), while the “road” pertains to the sea-based Maritime Silk Road (which will link China to Africa and South-East Asia). The reasons behind the OBOR Initiative include (but not limited to) expanding Chinese influence and further boost gross domestic product (GDP). The Initiative is an extensive long-term strategy to connect a vast land and sea network with China and could see up to $6 trillion in investment. The Asia powerhouse has already signed cooperation agreements with 68 countries, including developed nations such as Singapore and Israel, as well as Frontier Markets like Kazakhstan and Iran. According to the prospectus, the ETF will have sizable allocations in China (44%), as well as Russia (6%), Singapore (10%), Malaysia (8%) and Israel (6%). Chinese-related securities that may be involved in the Fund include A-Shares, B-shares, P-Chips (private sector, traded on Hong Kong Stock Exchange) and Red Chips (public-owned). Sector and Country weights in the MSCI Global China Infrastructure Exposure Index, designed to track companies related to the One Belt One Road Initiative. The ETF will track the MSCI Global China Infrastructure Exposure Index (“The Index”), which is designed to “represent the performance of listed companies within Developed, Emerging and Frontier Markets with high revenue exposure to China infrastructure development”, particularly in the OBOR Initiative. In terms of sector weight, The Index has significant allocations in Industrials (39.21%) and Materials (22.83%), while also boasting a noteworthy 45.31% weighting in Chinese equities with the intention of targeting a fixed allocation of 45% and 55% for China and ex-China securities respectively. The Index has returned 7.64% in the last three months. In relation to charges, the ETF has an annual fund operating expense gross fee of 0.8% (0.79% net) and is aiming for annual distributions. There are currently 92 holdings in total. The OBOR ETF comes as a welcome edition to KraneShare’s Chinese-focused range, along with the likes of CSI China Internet ETF (KWEB), China Commercial Paper ETF (KCNY) and Emerging Markets Plus ETF (KEMP), the latter gearing significantly towards both China and India relative to other emerging market countries. Investment bank China International Capital Corporation purchased a 50.1% majority stake in KraneShares in July. Follow Frontier Market News on Twitter!